The main aim of our work is to understand how different parts of the brain co-ordinate their activity across long distances, by studying the basic circuitry in health and disease. In recent years, neuroscience has made great strides towards understanding connectivity within neural circuits. 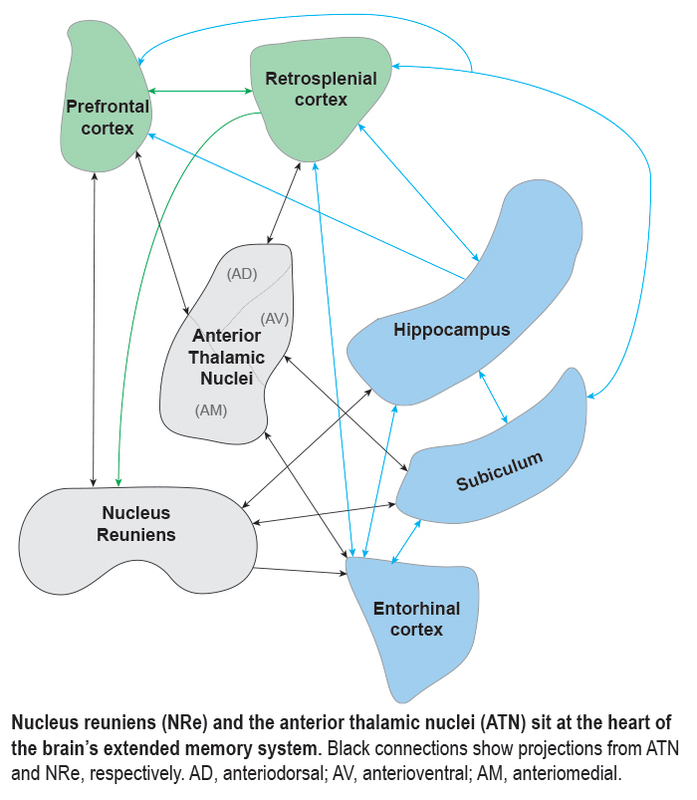 It is becoming increasingly clear that many neurological and psychiatric disorders are caused by dysfunction not only within local circuits, but also by a breakdown in communication between different regions. We focus on an interconnected circuit, shown below, which is intricately associated with memory and decision-making. These regions are affected in numerous neurological and psychiatric disorders, including Alzheimer’s disease and schizophrenia. The premise that drives our research is simple: it will be impossible to understand why different neurological or psychiatric conditions can affect the same circuits in the brain but cause very different symptoms unless we first unravel the circuitry, at the cellular level, that links these regions together. The methods that we use are in vitro and in vivo electrophysiology, combined with optogenetic or chemogenetic manipulations of neural circuits, as well as anatomical studies and virus-assisted circuit-mapping. We are currently also building up expertise in behavioural neuroscience, with the aim of being able to study neural circuits from synapse through to behaviour. We have a particular focus on inhibitory interneurons: while making up only a minority of cortical and hippocampal neurons, inhibitory interneurons play a profound role in co-ordinating the activity of the brain’s circuits, and underlie many of the rhythms of the brain, that are generated through the coordinated activity of large groups of neurons.